After what’s seemed like weeks of teasing, Jennifer Lawrence *finally* got revenge on Chris Pratt and it’s so epic and totally savage. Both Chris and J.Law are on the promotional tour for their new movie, the science fiction epic Passengers, and it’s safe to say that there has been some joking going on along the way. Firstly, Chris shared a “selfie” on Instagram with Jennifer. However, he’d totally cropped her out of the picture. Things then heated up — every picture Chris shared of him and Jennifer he’d cropped her out of it, and he teased us all sharing this picture of himself wearing a Jennifer Lawrence mask. Things then reached a climactic moment when they threw insults at each other (although it was all in good fun, so no sweat). 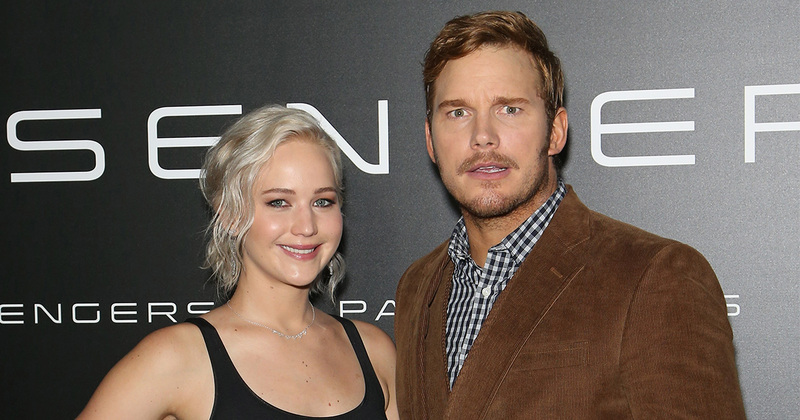 Well, now Jennifer Lawrence has decided to get her own back on Chris Pratt for all his pranks it’s so brutal. Standing up and walking out the studio, Jennifer and Jimmy headed outside where they were greeted by an open top bus plastered with the poster for Passengers. Then things got ugly…Jennifer Lawrence proceeded to spray paint all over Chris’s face. Jimmy, of course, couldn’t resist and decided to get involved, too. Watch the full clip of Jennifer Lawrence and Jimmy Kimmel going awol with some spray paint and Chris Pratt’s face below. Despite their joke fighting, however, it does seem that J.Law and Chris Pratt genuinely like each other. In fact, the pair were asked to share their favorite thing about each other and it’ll make you swoon. Chris said that Jennifer was “beautiful on the inside” and complimented her humor. Similarly, J.Law said that she was blown away by Chris’s talent. Aww! Seriously, aren’t these two just #FriendshipGoals AND #PrankGoals?